There is a new toy in town, Pleo brought to you by Ugobe. This company's inventor and co-founder is Caleb Chung, the same guy who co-invented the Furby 1n 1998. Pleo has 14 motors and six processors (Furby had one of each), a nose-mounted camera and 30 sensors. It's sensitive to touch, noise, movement, and even other Pleos. The news releases started in 2005, with its much-delayed release happening on December 18, 2007. This robotic pet costs $349, but current owners seem to think its worth it. People are obsessed with these! There are Pleo videos, songs, skits.... owners can even keep a Plog about their robotic pet. In this March 13th, 2008 Nightline episode, newscasters describe Pleo as "straddl[ing] the line between pet and product." You can get a tour of the Ugobe labs, in this first webisode in the Ugobe series of videos titled "Behind The Scenes: The Making of Pleo." You can see the rest of the videos in this 6 video series by visiting the website. Pleo is based on the three laws of Ugobe life forms. You'll notice that the people obsessed with these toys are adults. 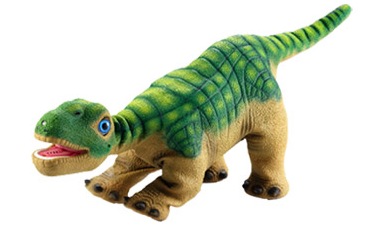 In fact, techies everywhere can rejoice in knowing that you can program Pleo using the Pleo PDK as well as a variety of 3rd party tools. "Complex Pleo programming will require a knowledge of the C programming language and a comprehensive understanding of Pawn scripting and the UGOBE Life OS." (source) Umm... that doesn't sound like the skills of your average 4 year old. Where else would you expect this toy to be developed but California? In Emeryville, CA to be more exact. I drive through the town every morning on my way to work! i had one of these at an old job. at first, i thought, what a silly concept, but had i not lived-to-believe it, i fell in love with this crazy inanimate object.